The Cordwood Draggers tip their hats to a moment in time when the rustic bug-eyed bop of Opry and Hayride stages collided head-on with young upstarts cutting sides for Mercury and Starday. The Draggers deliver a no-holes barred mix of hillbilly bop like it never went out of style. 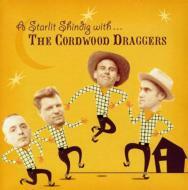 A Starlit Shindig with the Cordwood Draggers marks the band's third release on the El Toro label and finds the fella's firing on all cylinders like never before. Shindig was recorded and mixed in just two days, capturing all the excitement of a typical live show. Mick's ear for a melody, searing guitars and a solid rhythm section help nail a sound that has left audiences across the globe hollering out for more. Original material proves that this band are no two-bit tribute act, these songs are testament to the highs and lows of an after-hours lifestyle and the promise of better times. If you buy one record this year make sure this is the one. You won't be disappointed! 05． Where's Ya Stay Last Night?